Where: The Daystar Center, 1550 S. State St. The Seventh Victim (1943)—The RKO movie factory was working at full tilt, with producer Val Lewton releasing four films in 1943! The plot of The Seventh Victim surrounds a businesswoman named Jacqueline who aligns herself with a Satanic cult in order to gain success and power. Eventually, she decides that she wants out. The cultist will let her go—if she agrees to commit suicide. Jacqueline tries to escape, but finds the cultists mean business. Classic scenes: Jacqueline’s younger sister Mary discovers strange activity on a New York City subway and Jacqueline encounters a cultist on a deserted back alley. 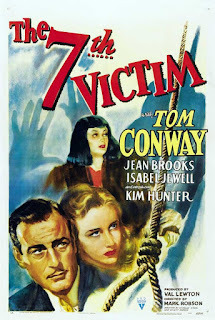 The film stars Lewton stock company actors Tom Conway, Jean Brooks, and Isabel Jewell. 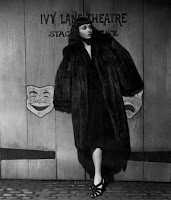 The Seventh Victim also introduced eventual Academy-Award winner Kim Hunter* to filmgoers. Directors like Alfred Hitchcock (Psycho), Roman Polanski (Rosemary’s Baby), and William Friedkin (The Exorcist) were all influenced by this Lewton horror classic. Before the movie, grab a cup of coffee from Overflow Coffee Bar, located within the Daystar Center. You can bring food and beverages into the auditorium; we even have small tables set up next to some of the seats. General Admission: $5 Students and Senior Citizens: $3. If you would like to RSVP to the movie, click here. Tickets will be available at the door. *Hunter won an Academy Award for Best Supporting Actress (1952) for her role as Stella in A Streetcar Named Desire.